It's not an EQ in the conventional sense, but Clariphonic DSP mkII is quasi-magical in its sweetening and enhancing powers. Powerful, musical top-end boost. Visually improved interface. Interesting band interaction. Dual channel processing. Generous upgrade pricing. Very specific functionality. Noticeable CPU hit. 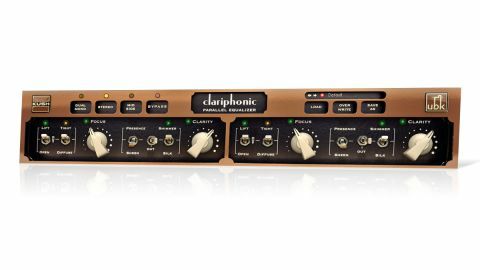 Clariphonic is a stereo hardware device offering treble-focused EQ, with two parallel processors per channel, and the original Clariphonic DSP aimed to capture its essence in software. In creating this sequel, Kush has decided to rebuild it from scratch. The most obvious change in Clariphonic DSP mkII (AU/VST/AAX) is that it provides three channel modes: stereo, dual mono and mid/side. Other 'surface' changes include LEDs showing what position each switch is in, and integrated preset access, although the factory presets were unavailable at the time of writing. "Each setting adds its own characteristic flavour to the top end"
The most significant improvements, however, have been made under the hood, with brand new filters very accurately emulating the dynamic nature of the hardware, and newly customised oversampling and filtering algorithms targeted at the high frequencies that are Clariphonic's area of operation. Theoretically, it all helps to produce a more open sound than that of the original plugin. The plugin's two 'boost only' EQ modules are named Focus and Clarity. The active frequencies of each are selected via a pair of toggle switches, with the central Off position used to bypass its host module. Focus has two frequency boost settings: Lift (800Hz and up) and Open (3kHz and up). We found the two very similar in behaviour, with Lift filling out the lower mids a bit more - good for enlivening snare drums without thinning them out. The Focus module's Lift and Open settings are partnered with a choice of two shapes: Tight (very wide bell) and Diffuse (shelf), used to tailor very high frequencies. At maximum gain, both Lift and Open deliver about 15dB of gain at around 5kHz. This increases a little beyond this point for Diffuse and tails off slightly with Tight. Clarity provides one of four shelves: Presence (4kHz), Sheen (8kHz), Shimmer (18kHz) and Silk (34kHz). The maximum gain is around 20dB at these corner frequencies but drifts a bit higher beyond them. Each setting adds its own characteristic flavour to the top end, rising from upper-mid presence and powerful brightness (Presence and Sheen) to more subtle air (Shimmer then Silk). Between them, it's easy to find a flavour to suit any source, be it drums, percussion, vocals, synths, guitars or even a full mix. However, with Clarity being such a powerful control, care needs to be taken not to overdo it. Combining Focus and Clarity actually pulls back the highest frequencies a few dB, rather than increasing the gain. This is by design, with the various combinations of the two providing further tonal colours. Clariphonic DSP mkII does consume a fair bit of CPU (one stereo instance ate about a fifth of one core of our 2.3GHz i5 processor), so it's not a plugin for every channel.It's also moderately pricey, (though owners of the original can upgrade for $49). If you can live with both of those points, you'll find that this remarkable plugin delivers some of the smoothest high-frequency boosting you're ever likely to come across.